3.5 years in the making - AA4 launches in late April! Centered around an experimental artist publication, AA4 is an art project that utilizes a chance encounter with the sound of a typewriter to produce new music. 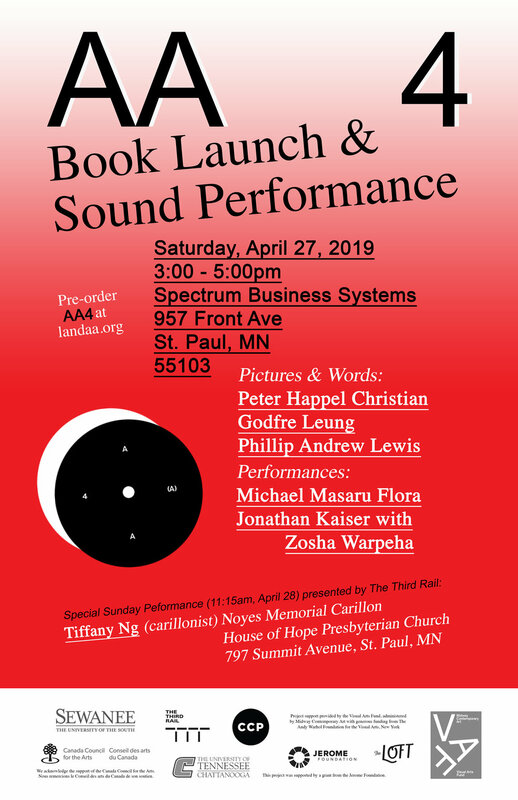 Artists Peter Happel Christian and Phillip Andrew Lewis, along with curator and critic, Godfre Leung, will launch the publication with a reading and present live musical performances at Spectrum Business Systems, a typewriter repair shop located at 957 Front Ave. in St. Paul, MN on Saturday, April 27 from 3:00-5:00pm. AA4, designed by Elana Schlenker, includes an experimental text by Godfre Leung, a 12” vinyl record of music by eight musicians, a drawing by Lenka Clayton, and sheet music of the original score. The launch event will feature an introduction to the project by Peter Happel Christian and Phillip Andrew Lewis, a reading by Godfre Leung, performances by Minnesota-based artists Michael Masaru Flora and Jonathan Kaiser with Zosha Warpeha, and a small exhibition of typewriter models owned by Ansel Adams. A special performance by carrillonist, Tiffany Ng, whose music is included on the record, will occur at House of Hope Presbyterian Church at 797 Summit Ave. in St. Paul, MN on Sunday, April 28, beginning at 11:15am. Interpretations by Flora, Kaiser, and Ng are all included in the AA4 record. Additional contributors on the record include Chris Duncan, Barbara Held, Steve Roden, Greg Pond & Cesar Léal. The soul of AA4 is a found audio recording of a letter typed by Ansel Adams, the contents of which are unknown. Working with a sheet music transcription of the typewriter sounds as an original musical score, Happel Christian and Lewis, who have collaborated on art projects since 2007, and Leung commissioned artists and musicians to execute interpretations of the score to create new sounds works. Included with each copy of AA4 is sheet music of the original typewriter sound which can be performed on any instrument by any person. The project embodies the spirit of Fluxus and proposes that chance is a primary element in the making of art. AA4 is the fourth volume in what will be an eleven volume set of artist publications by Happel Christian and Lewis. The multidisciplinary project was produced with generous support from the Ansel Adams Fellowship at the Center for Creative Photography, a Visual Arts Fund from Midway Contemporary Arts and The Andy Warhol Foundation for the Visual Arts, the Jerome Foundation, The Loft Literary Center, The University of the South, University of Tennessee at Chattanooga, The Third Rail, and the Canada Council for the Arts. Nous remercions le Conseil des arts du Canada de son soutien. PRE-ORDER AA4 right here. Orders will ship June 2019. A limited number of advance copies will be available on April 27.